The Tampa climate can support an amazing level of diversity with lawns, shrubs, and landscape plants. It can be overwhelming the variable types of foliage plants alone. There are many methods and techniques to acquire an excellent looking landscape. It takes more than just lawn fertilizing and mowing; it also takes shrub services that help landscape areas grow thick and lush for heightened curb appeal. A professional lawn service company like Green Solutions can evaluate your shrubs, bushes, small trees and palms properly and provide the lawn services necessary for a thriving rich lawn. We provide an excellent variety of miscellaneous lawn care and landscape services including over seeding of lawns, RoundUp applications, lawn aeration services, and soil testing. Core aeration of the lawn can be helpful if you have compacted or heavy soils. We can over-seed bahia grass, perennial rye grass, common Bermuda grass, or annual rye grass. We can apply RoundUp to your natural areas or open landscape beds. We can treat your oak trees to control the moss hanging from them. 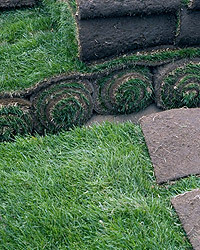 Sometimes we even install plugs of St Augustine grass or zoysia grass to enhance the density of the lawn in places where it has become a little bit thin. Green Solutions is ready to help with a variety of lawn, shrub, and pest jobs. We even provide fire ant removal and prevention. Join our list of lawn service maintenance customers and see why we are the leading Tampa lawn service company.